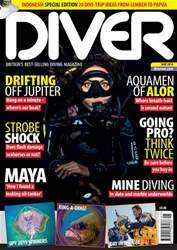 (1 Customer Reviews) | Write Review 12 issues per year DIVER is Britain's best-selling scuba diving magazine – regularly out-performing all its competitors combined on the open market. 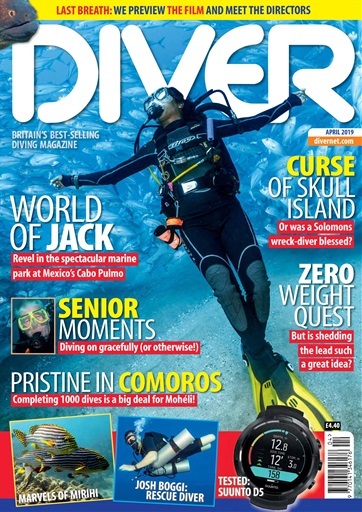 DIVER Magazine's coverage of every aspect of the sport is unrivalled, especially in the realms of dive-gear testing, training, dive holiday destinations and underwater photography. Over more than four decades it has established a formidable reputation for expert and authoritative reporting of the news, views and features that matter to all scuba divers. 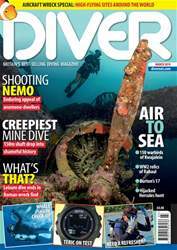 Looking for DIVER in print? Unfortunately pocketmags.com does not sell print copies of DIVER, but all is not lost. Our partner at magazine.co.uk sells print subscriptions at the best prices online. CABO PULMO – Henley Spiers is bedazzled by 500% more fish in Mexico. MATURE DIVERS – Old divers, bold divers and those who draw the line. COMOROS – There’s pristine… then there’s Mohéli, crying out to be dived. OCEAN ART – Striking images from the annual photo contest. JOSH BOGGI – Meet the world’s first triple-amputee Rescue Diver. MALDIVES – Fish are the stars at a laid-back resort. SOLOMON ISLANDS – Rejoin the ‘cursed’ Mark Hatter in the Solomons. LAST BREATH – We review the new film and talk to the directors. 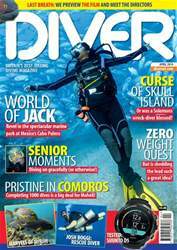 You'll receive 12 issues during a 1 year DIVER magazine print subscription.